As a company we develop ideas, invest in both tooling and manufacturing equipment and produce the products in our own factory for Global distribution. This project was started maybe 4 years ago and is only now at a stage where we are happy to launch the product globally. Initially the idea came from doing many store openings at Staples UK. 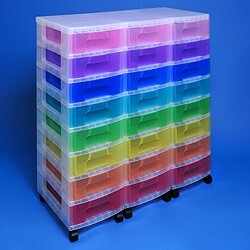 There were many requests for a storage solution to store our boxes when not in use. The normal requester was a crafter who would use our boxes for certain projects and maybe take them to classes or friends to work on, after which they wanted to return home and store the product. I vividly remember one such encounter at Staples store in Coventry. From this need we grew the concept, and contacted a UK design house to convert this concept into a feasible product that had all the characteristics of a great Really Useful Product. It was amazing! We spoke for maybe 2 hours and the head designer just stood up and on a large presenter pad scribbled all my thoughts onto the sheet. His sketch was perfect. Originally the brief was to create a racking, shelving system for our boxes. Once we had the concept we asked for tooling quotations from both our European and Chinese tooling partners. Our European partners declined the project as it was too bold in scope but our Chinese tooling partners grasped the project. Originally I wanted to make the system for our 4, 9 and 19 litre European sized boxes. The Chinese thought the 19 Litre was too much of a leap and so we set about making only the 4 and 9 litre legs and an open top. The Chinese did the production engineering and after several visits over to their factory we launched the initial product. With the knowledge gained we then developed the 19 litre leg and created a top with a stationery tray insert in it. It was then apparent that we should use drawers as well as boxes for storage and organisation. 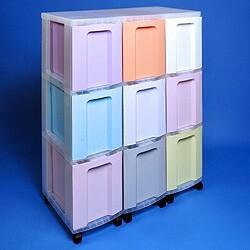 Drawers are also more cost effective as obviously we do not need to manufacture lids and handles. We used the same team and realised that we could also link units together ...And the idea for the triple linking top was born. We believe this is a world's first. As the project developed we have invested in state of the art machinery to manufacture these items. The machine that manufactures this triple top cost around $1 million. Other machines have also been purchased to support the project. I remember asking the Chinese to produce the triple top in 10 weeks, in time for the World's most important stationery exhibition - Paper World, held in Frankfurt. They asked if we had all the design details and of course we had not. So the deal was that providing we agreed the design in 5 days they would have samples available in 10 weeks. We agreed the design and I booked my flight to visit China in 10 weeks' time. Miraculously everything was on target. I thanked their main project engineer for delivering the product in time for the show. Mr Lam's response was please do not thank me - that is my job. What an amazing response. This response has affected how I run the business. We duely wrapped up the samples and brought them home as our hold luggage. I think I paid $100 extra luggage costs! On arriving in Manchester the airline had lost the samples. Of course I was so exhausted I had lost the baggage receipts and so I had to report the loss of my samples and it was obvious that the clerk felt I was doing an insurance hoax claim. So with 3 days to go to the show I had seen samples but the product was lost on route to Manchester from Hong Kong. The next day the package was found and delivered and now all I needed to do was take it to Frankfurt - still maybe 400 miles away. The product was received well at the show. We then started to receive the drawer units as samples and I was very unhappy with the fit of the draw units to the storage towers. This was to do with the fact that our boxes are flush to the tower but the drawers protrude as they have flanges, and the higher the draw then the more it protrudes. I did not expect this and were totally unhappy with what we had. We spent weeks assessing the problem - a lot of this in China - and we agreed to redesign the tower legs and reposition the fit of the tops. This is why both the old and new units take the draws but only on the new units with the front lips do they fit correctly. I vividly remember being in China during an annual holiday - Dragon Boat Day - and being taken to watch this amazing event. Afterwards we visited a Wal-Mart China store, and we were studying the fit of the drawers to the existing products. We must have looked strange - two Englishmen with maybe 6 Chinese looking at drawer units, and we must have been the only westerners in the store. Most of the tooling was in the UK so we had to manufacture and store three months' stock of the existing product and ship the tooling to China for these major modifications. These change costs were obviously our responsibility as we had not the foresight to design the initial product for both boxes and drawers. All modifications were done and after many visits we were happy with how everything fitted. This was now September 2010. The tooling was partly flown and partly shipped back to Europe. We then started to experiment in colours and products and that brings us now to the product launch. The product was designed as a global project to hold both European and USA popular paper sizes of A4 and letter paper. We have created a flat top which is ideal for placing your printer on, the large size (25 litre drawer) takes both A4 and letter suspension files. 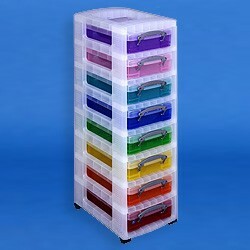 We feel this is the first time this feature has appeared on a plastic modular drawer system. The system is totally modular. 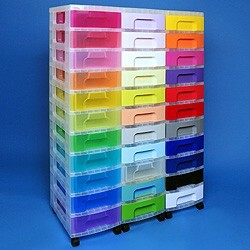 We have also added a stationery tray so it is really the world's first plastic office draw set. The product is stronger and more robust than anything currently available, but also it is the first time a drawer unit has been especially designed for the Office use and specifically for paper. 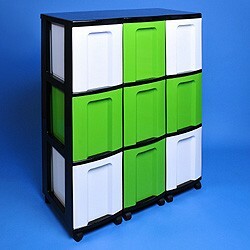 Of course it will also be used in the home, say kitchen, bathroom, garage and home office. Our employees are already buying many samples with our generous staff discount policy, so already the product has a life of its own. We have also innovated in using many different colours for legs, tops and drawers, which allows you to create your own personal unit. Since receiving all the tools in Europe we have already invested in two additional variations which hopefully mean that the project is set to keep growing. Now please buy the product as it means all our hard work on three continents should pay off. The future development of this idea is based on how well we manage to convince you to buy, use and love the product!